Bills GM Doug Whaley is facing the music today, giving an end-of-season press conference after a mess of a year and apparently failing to inspire much confidence that the Bills are internally healthy and ready for a turnaround. The first sign should have been when the interim head coach Anthony Lynn said he wasn’t involved in the decision to start E.J. Manuel at quarterback in Week 17. 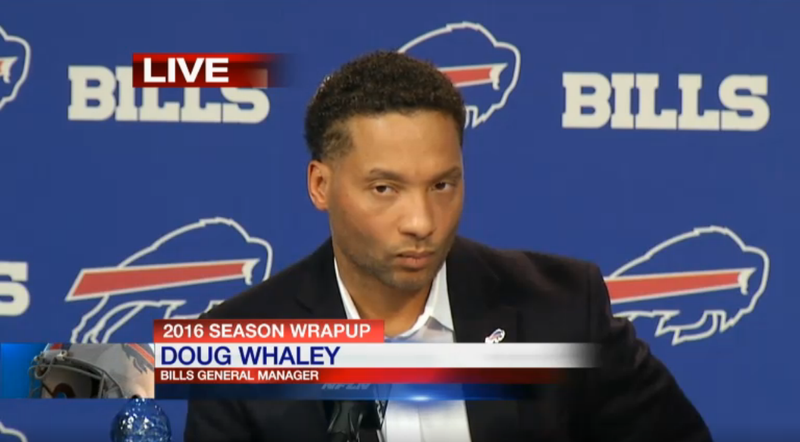 Today Whaley revealed that he wasn’t involved in the initial decision to fire Ryan. OK, but surely at least Whaley was involved in the call to name Anthony Lynn interim coach? Mmmhm. And who picks the next coach? Whaley, by playing the good company man and/or by protecting the Pegulas, is painting a picture of a disastrous situation for a GM, where he isn’t consulted on and isn’t informed about major hiring and firing decisions. His actual powers remain suspect; his ability to act as anything other than a spokesperson for the owners is questionable. And he didn’t even get to do that! The local reporters are savaging Whaley’s press conference. What a shitshow. If you’re a coach or a GM, I can think of roughly 31 teams, give or take a Jed York, that sound like they have more attractive jobs than those in Buffalo.